PRAGUE -- PSA/Peugeot-Citroen and Kia employees in Slovakia are working extra hours to make up for car production that was lost during the region's gas supply crisis. The two companies have restarted production after supplies of natural gas to the country from Russia resumed. "We have decided to produce cars on Saturdays so we can make up the loss. We were stopped seven days so we lost up to 6,000 cars," said Peter Svec, spokesman at PSA's plant in Trnava. 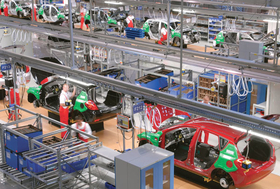 The factory makes the Peugeot 207 and Citroen C3 Picasso. Kia is making up the lost production at its Zilina plant by reducing a planned cutback in working hours. The automaker planned to reduce its working week to 30 hours from January 12. "Now the working times will be 35 hours a week on average," said Kia spokesman Dusan Dvorak. Kia makes the Cee'd lower-medium car and Sportage SUV in Zilina.